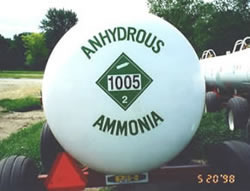 Pioneers in the industry, we offer anhydrous ammonia storage and transportation tanks from India. We design & manufacture Anhydrous Ammonia Gas Storage and Transportation Tanks of various capacities up to 200000 liters. The tanks are provided with all accessories like internal valves, pipelines, safety fittings as per requirement. All safety features are incorporated in the design of the tanks.